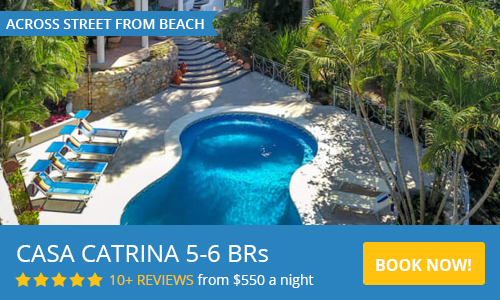 Villa Del Mar in Sayulita is a 806 sq. ft. premium one bedroom one bath unit located in the boutique hotel Villa Amor. The Villa offers sweeping views, private patio and a perfectly appointed kitchen. This Villa has full access to all of the Villa Amor ammenities including an infinity pool, outdoor seating and gardens, daily yoga and unqiue access to the new and famous Si Senior restaurant. This Villa is located on the fifth floor of the newer building. Enjoy panoramic ocean, village and jungle views from the private balcony as well as from the bedroom and living room. The doors can be opened all the way so you can enjoy the breeze and sounds of the waves, or can be completely closed should you need air conditioning. 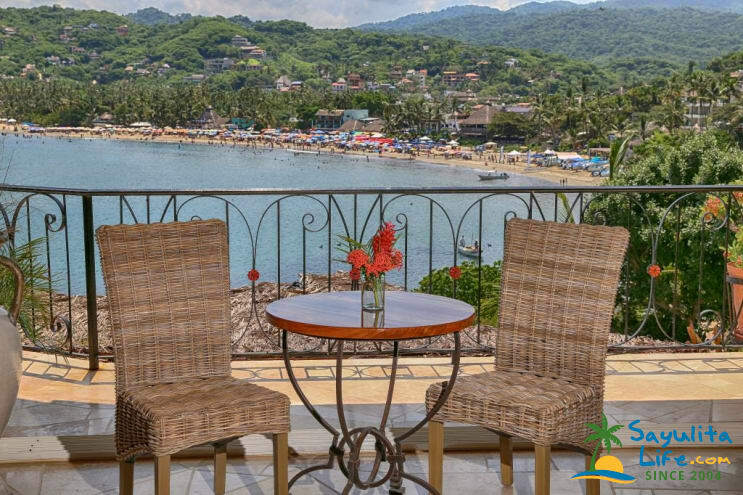 Villa Del Mar is a lovely, romantic vacation rental accommodations in Sayulita. This personal and comfortable Villa allows for comfort, rest and enjoyment of the wonderful sea air. You can also combine the rental of a premium one bedroom unit right next door, making this a perfect, private get away for friends or couples. We do own other Villas at Villa Amor so let us know what you need! If you like gazing up at thousands of stars in a flawless sky, going to sleep to the lulling rhythm of ocean waves, waking to the sun peeking over mountains and the chorus of the pelicans beginning to feed – then Del Mar Villa at Villa Amor in Sayulita, MX is the place for you. After navigating the several flights of stairs and opening an old, thick, wooden door, you enter into your private world. From the well-equipped villa, a picturesque, short walk takes you into the small, vibrant town of Sayulita. However, you only have to talk a few steps to enjoy your cup of coffee, or glass of wine, on your private expanse of a patio overlooking an inlet of the Pacific Ocean. The wall to wall windows in the villa welcome in the cool breeze of the ocean. At the bottom of the stairs from Del Mar Villa is the lovely, dreamy, al fresco ‘Si Senor’ restaurant. Don’t miss the spicy margaritas and table made guacamole. If you want a true Sayulita life experience, then Del Mar Villa is for you! What a fantastic experience! Great villa with ocean views. I enjoyed eating breakfast on the patio every morning before going to swim at the beach around the corner (5 minute walk). Easy access to the village. The villa was clean and had everything I needed. Will do back sooner than later. My husband and I have stayed at two of Mark’s places at Villa Amor in July 2018 and loved them both! Great location, has everything you need, and a beautiful view! We rented a golf cart, which Marks assistant set up for us and it was there waiting for us when we arrived. You don’t really need the golf cart because town is so close but we really enjoyed having one and being able to explore farther than we would have preferred to walk. Can’t say enough good things about Villa Del Mar and Villa Tranquila. The maid service was also excellent (only Spanish speaking so brush up if you’d like to communicate with them) and both places had all of the kitchen equipment and beach items we needed. Just at the bottom of the driveway there is a place you can rent paddle boards (at the Amor Botique Hotel office) for a small fee and that was very convenient as you can walk right into the water from there. We also really enjoyed that the location was not too close to the main beach in Sayulita but perfect distance to be able to walk to that beach or to Playa de los Muertos. Just after sunset if you walk to Playa de los Muertos you will notice fire flies along the way and we really enjoyed that and made a point to see them nightly. All of the people we encountered in Sayulita were very nice, we felt very safe, and the food was all excellent! We are now planning our trip back to Sayulita for March 2019 and will definitely be staying at Villa Amor! One of our favorite vacations ever! Villa Del Mar is GORGEOUS with stunning views, a lovely layout, incredible art including the door itself to enter the Villa! The grounds at Villa Amor are stunningly beautiful and we loved the Villa Amor O restaurant, perched by the waves, especially for a relaxed brunch - the food was so delicious. the staff impeccable and prices reasonable. The pool area was beautiful, although we spent most of our time in the ocean, but it was lovely in the evening after a day out and about. But the most incredible part of our stay was the staff of Sayulita at your Service. Nick and Gabbi are some of the most caring, attentive, wonderful and fun people we have encountered on our travels and they made sure our every need was tended to from the car from the airport to welcoming us at arrival (with cool drinks in the fridge) and offering perfect personal recommendations for places to eat in town. We shall return! Staying at Hotel Villa Amor (Del Mar) is a joy. Sayulita is a magical place and at the end of town the comfort and solitude found there is special. Very friendly service, great restaurant on the ground floor with amazing views of Bandera Bay. Close to locals beach that is family friendly. We loved the walk into town, as you can walk down the stairs and on the beach or along the street, although be advised it is a 10 minute walk each way. The view if you're above ground floors are breathtaking. Nice little kitchen and AC, very open floor plan. Feels like you're staying within a beautiful portrait. Decor is traditional and has fun character. Gabbi is an excellent host and you are sure to enjoy your stay! Very honest and accommodating! This was our second time staying in this room at Villa Amor. The view is fantastic and the room is great. The addition of the pool is great. We wanted to relax and am happy to report: Mission accomplished. First and foremost, I love Sayulita—one of my favorite towns to revisit. This is my second time staying at Villa Amor (the first was booked through the hotel), but I would go this route any day. I didn't get the chance to meet Gabbi, but Nick was extremely helpful and friendly. As two young(ish) ladies, he recommended a bunch of restaurants/activities to check out, and those to avoid. Sayulita is a safe town, but you can never be too careful so his advice was much appreciated. The room itself is amazing: the shower is huge (and the water warm), ample shelving/closet space for clothes, basic necessities in the kitchen, the bed is pretty comfy and the view—waking up to that every day, wow. I highly recommend booking with these guys and taking advantage of all the town has to offer. Great view. Nice place. Excellent service! Take advantages of our shoulder season discounts for May, June and October, 220 USD nightly!!!! !